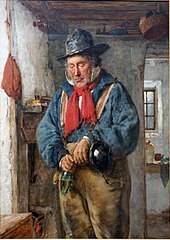 A man pours some whisky into a flask in this 1869 oil painting by Scottish artist Erskine Nicol. ^ a b New English Dictionary on Historical Principles, entries for "usquebaugh" and "whisky". ^ Zandona, Eric. A World Guide to Whisk(e)y Distilleries. Hayward: White Mule Press. ISBN 0983638942. http://amzn.com/0983638942. ^ Martin Levey (1956). "Babylonian Chemistry: A Study of Arabic and Second Millennium B.C. Perfumery", Osiris 12, p. 376-389. ^ a b c Book A Short History of the Art of Distillation, by Robert James Forbes (year 1948). That book covers distillation in general. For the early history of the distillation of alcohol specifically, search for the word "alcohol" in that book here . ^ Forbes, Robert James (1970). A short history of the art of distillation: from the beginnings up to the death of Cellier Blumenthal. BRILL. ISBN 978-90-04-00617-1. https://books.google.com/books?id=XeqWOkKYn28C 2010年6月29日閲覧。. ^ The History of Whisky History Archived 25 January 2010 at the Wayback Machine., The Whisky Guide. ^ Annals of the Kingdom of Ireland, p.785, footnote for year 1405. This is likewise in the Annals of Connacht entry for year 1405: Annals of Connacht. ^ Ross, James. Whisky. Routledge. p. 158. ISBN 0-7100-6685-6. ^ Peggy Trowbridge Filippone, Whiskey History - The history of whisky, About.com. ^ Whisky in India. Livemint (29 December 2011). Retrieved on 23 December 2013. ^ a b c d Magee, Malachy (1980). Irish Whiskey - A 1000 year tradition. O'Brien press. p. 144. ISBN 0-86278-228-7.